I am excited to announce my new site Mommy Prep School. To those of you that have been following me as I built Yellow Loves Grey, thank you. I have appreciated your readership, comments, and our relationship. I originally started Yellow Loves Grey to be the place I share the research and advice I found as I was going through my experiences as a new mom. It slowly evolved into a place for me to share what I was doing and what my family was experiencing. As much as I am myself on Yellow Loves Grey, I kept struggling with finding my voice. After a lot of thought and much trial and error, I think I have found my blogging voice. I’m a teacher and that is how I would describe my personality. As a result, I see the world through teacher eyes. I am always looking at my experiences as lessons, I am constantly reflecting, I plan, change and adapt as I go, and as annoying as it is, I’m always giving ratings and grades to my experiences. This realization led to understanding my blogging voice. Mommy Prep School is my place to show how I look at the world. It is my journey as a parent from the lens of my teacher personality. I have been so grateful for your participation in Yellow Loves Grey and I hope you join me as I transition my online self to Mommy Prep School where our motto is Learning how to be a mom by doing mom things. 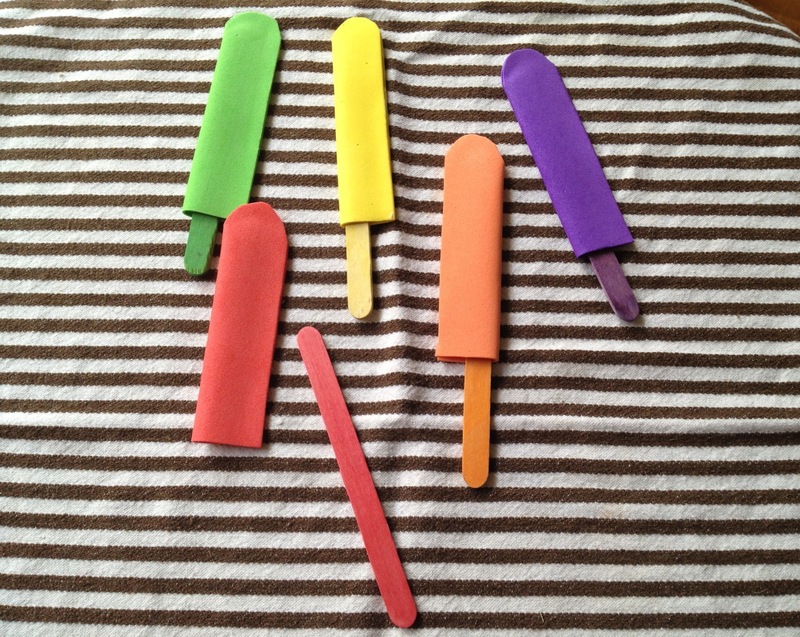 Some of my favorite summer memories consist of trips to the library, filling out library reading logs, and completing the library summer challenges. As a result, public libraries have a very special place in my heart. My parents are first generation Vietnamese immigrants. Growing up they did everything they could to help me with school work. Despite their hardest efforts their little English put limits on how much they could help me. Instead, my resourceful parents took me to our neighborhood library to get homework help, to check out books, and to spend time exploring whatever interested me. The library became the place you would often find me. I would be there after school completing homework with volunteers, reading the latest Nancy Drew books, or later in my jr. high years just meeting up with friends. On the weekends, my mom would pack my backpack with snacks and I along with my four (later five) younger siblings would spend our mornings at the library. Now, as a mom I am excited to come back to the children’s section of the library. As I walked my son around the children’s section I found myself transported back to my childhood. I smiled as I remembered checking out books on tape as a way to ‘read’ books that were too hard for me. I happily sighed as I recalled reading the backs of books to decide which ones would make my weekly checkout list. 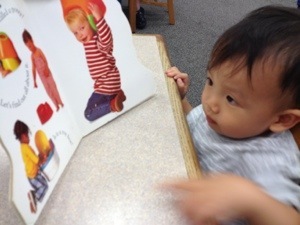 I hope my son will enjoy reading and find the library as familiar and safe a place as I always have. 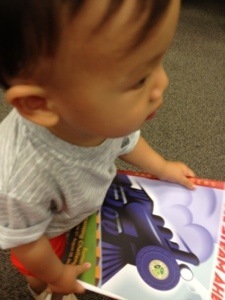 Last week, he became the youngest reader at our local library to participate in Rahm’s Reader: Full STEAM Ahead Chicago Public Library summer reading program. To participate in the program I have committed my little guy to 300 minutes of summer reading (about 20 minutes a day), at least one creative, one learning, and one discovery activity. We will log our reading and other experiences in the Full Steam Ahead booklet the library provided us. It’s already been a week since we have signed up and I am happy to report we are right on track. 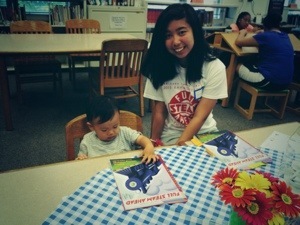 My little guy and the library volunteer that helped sign us up. My little guy reading his first book at the library. At first he thought the book was a book about how to party but then quickly realized it was actually about how to potty. He liked it anyway and had me read it to him twice. I recently hosted a Busy Bag Swap with some local Chicago moms. It was a hit. For those of you unfamiliar with the busy bag concept, it is an activity for your little one that is usually contained in a single bag. It is great for travel and easy to store. If you are interested in hosting a Busy Bag Swap here is how I hosted mine. I have seen these great busy bag swaps and want in on the action. What I am proposing is each mom makes 15 of the same busy bags to swap and we will all have lunch together! Bring your little one(s), pack your lunches, and (if you would like) bring some food to share. We’ll have lunch, the kids will play and we’ll exchange our busy bags. That means you’ll leave with 15 busy bags for your toddler! You can also Google “Busy Bag Swap”. Please comment and let us know what Busy Bag you’ll be bringing so we don’t have duplicates. Although I was hoping for 14 other parents to attend the swap, I got only 5. I was disappointed and wondered if I had done something wrong in my invitation, date I decided to host it, or time of day I picked. I decided not to dwell on that. Instead, I changed my focus on the positive; some time with other moms, possible new friends for my little guy, and new busy bags. The moms I met were all so nice and despite the rain came. Yay! In the end, my little guy has a total of six new busy bags to play with. 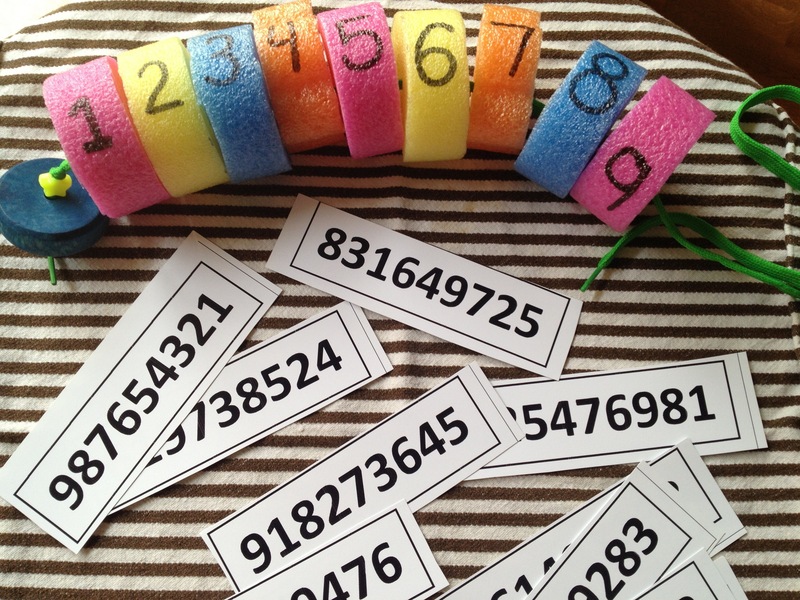 One mom brought a Pool Noodle Lacing game that is excellent for color identification, number and counting, and motor skills. We can thank Kirby from Planet of the Apels for this one. 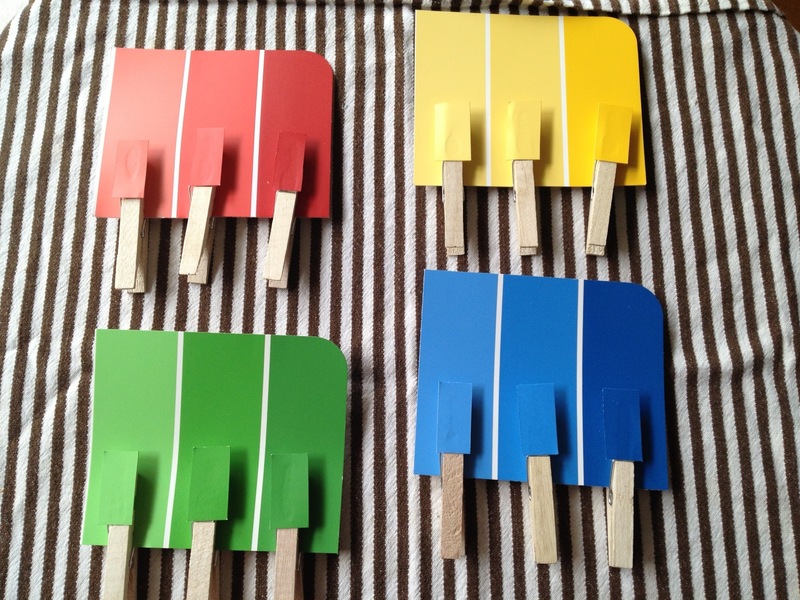 One crafty mom brought this great Popsicle Stick Color Matching game that can be found on Holli’s site Full Hands Full Hearts. 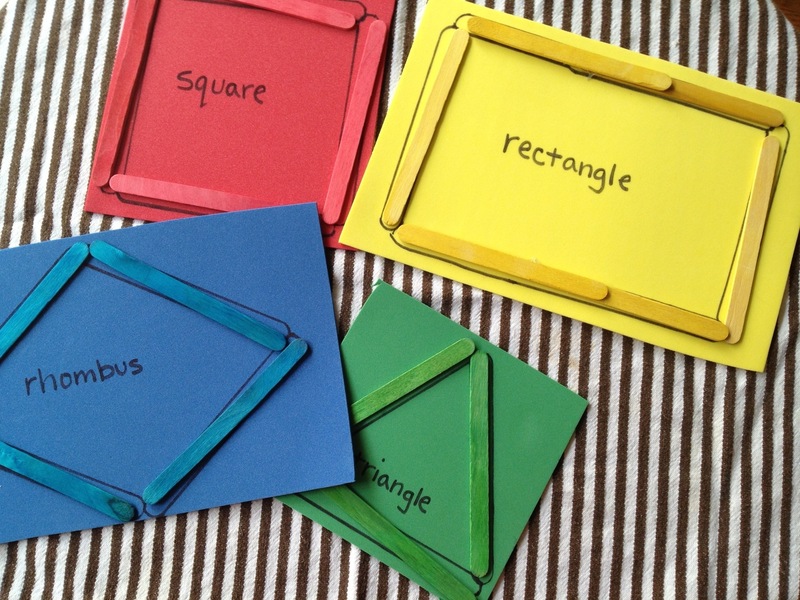 This geometric busy bag that encourages color matching and learning about shapes was inspired by Modern Parent Messy Kid. Another mom, who happens to also be a teacher, brought an Exploration Bag. Her busy bag was the only one to get us outdoors and exploring. I can’t wait to try it out with my little guy. 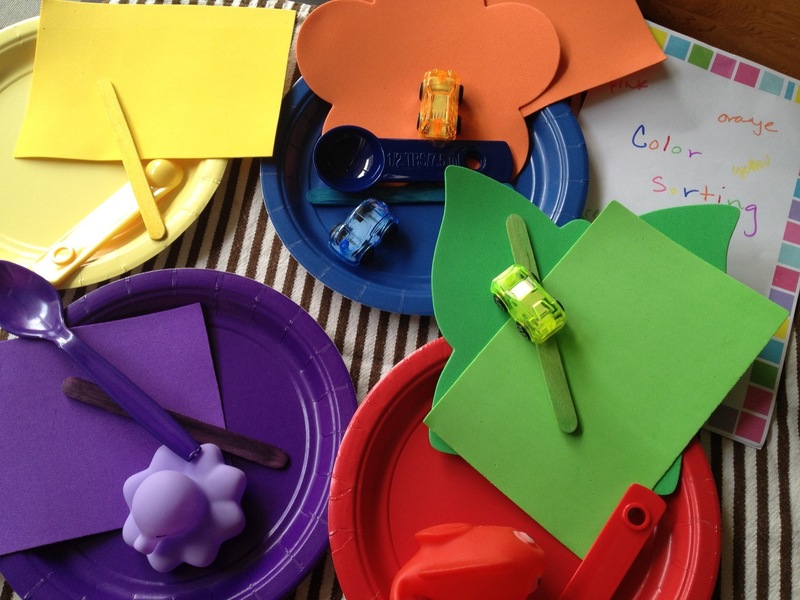 Lastly, this mom created this Color Sorting busy bag. Full of little toys, shapes, textures, and colors it is a tool for learning and practicing color identification and sorting. I love all the different items found in the bag and had fun sorting them for this picture. At 18 months old, my little guy hasn’t learned his colors. I think he knows the color blue, but that could be me just seeing something I wish was there. All the busy bags are great but at his current stage of development they’re still a bit advanced for him. Tonight, I broke out the color sorting busy bag to see how he would play with it. He ended up sorting the items in the bag not based on color but based on category. That was a fun activity him and I did for about 20 minutes. 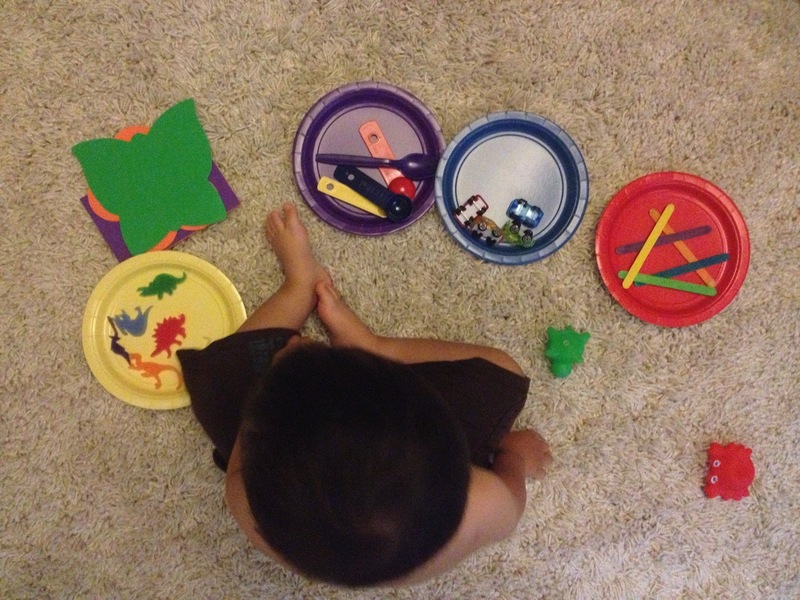 I would begin by putting one item on each plate and he would then sort the items. He sat in my lap as he picked out the cars, sticks, spoons, and dinosaurs. I am so grateful to the moms that put in the time and effort to make these bags. They turned out so great and I can’t wait to break out more for my little guy to enjoy. 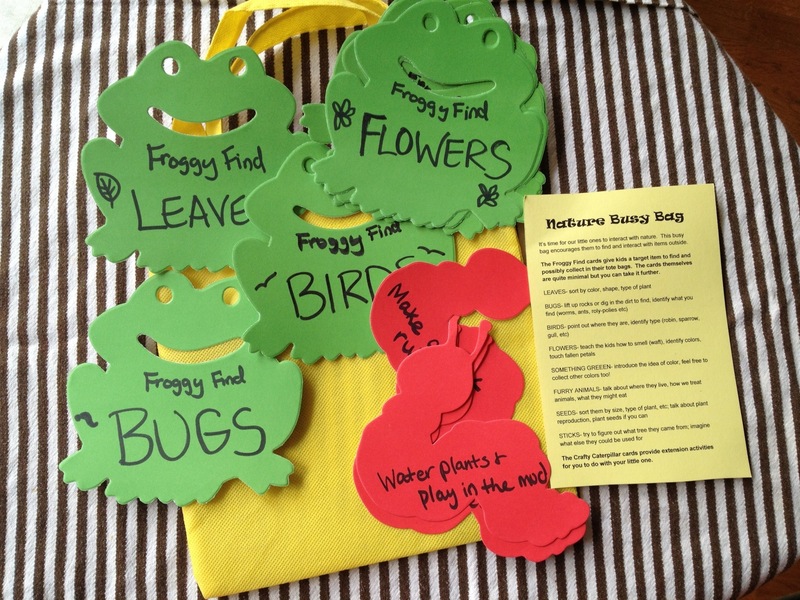 If you’re looking for a way to connect with other parents and at the same time gather some fun activities for your little one I encourage you to host a busy bag swap. 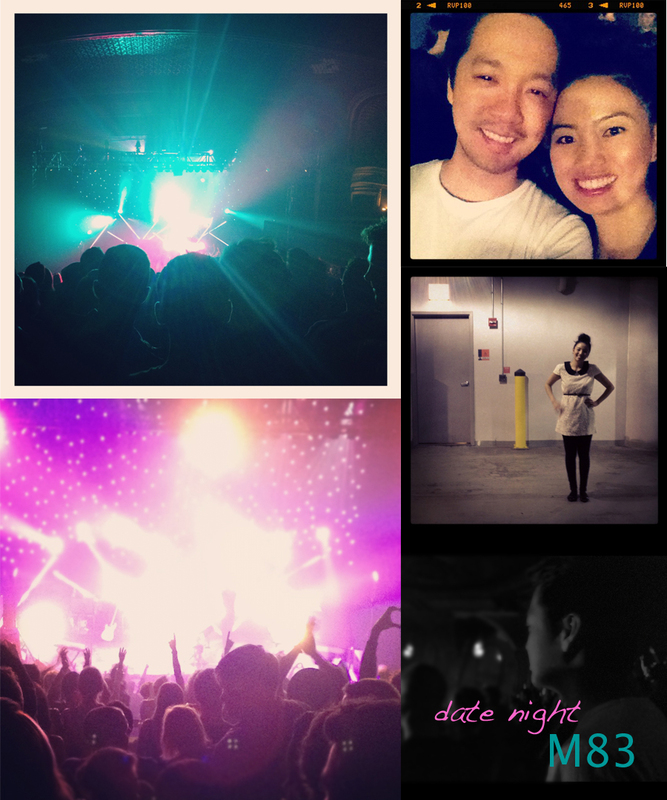 Last night, the mister and I had our first concert date night since having our little guy. We went and saw M83 at the Riviera Theater. M83 put on such a great show. Lots of energy on stage and among the concert goers. We danced to some of my favorite songs (Midnight City, Intro, Wait, Steve Mcqueen), got to play date night dress up, and best of all had some ‘us’ time. As we entered the concert venue, I started to get really excited. It was so nice to feel that type of excitement again. Being a new parent, our exciting moments really center around our little guy, but last night, it centered around our mutual love for live music. Even though our night out was just us two, being a parent was present the entire night. 10. We missed the opening show but were totally ok with it. We felt that making sure my mother-in-law and the little guy were ok was more important. 9. We both kept checking our phones throughout the night. I sent one text message to my mother-in-law asking her, “How is everything going?” and checked my phone for text messages or phone calls during every change in song after that message. 8. I was excited to wear exactly what I wanted without having to worry about how I would pop open the dress and whip out the girls to nurse. 7. While I was scrolling through my camera roll to look at the photos I had taken, I saw a photo of my little guy, I stared it smiling, and for a moment forgot I was at an M83 concert. 6. During one of the songs I turned to the mister and told him the keyboard melody reminded me of the little guy’s melodic cooing. 5. When the song Wait was being played I told the mister that our little guy loves that song. 4. The mister wondered if the sound blocking headphones for babies we had would have protected the little guy’s ears if he were with us. 3. We both imitated what we thought the little guy’s reactions would be if we brought him to the concert. How would he react to the different songs? All the people? The light show? 2. When we walked by the merch table I found myself looking for a M83 onesie. 1. The concert ended at 9:30. Instead of wishing it was a longer set, I was grateful to get home early and see my little guy. On a separate note, I am struggling with the idea of taking photos of myself for the blog. I really appreciate bloggers who post OOTD and thought I would do that too, but I’m so awkard in front of the camera. How has parenting affected your date nights?